Born in village of Hlebine, Republic of Croatia, on February 19, 1936. First oil paintings on canvas date from 1950. His first public appearance took place in 1954 in the town of Krizevci near Koprivnica, where he graduated at the Teachers’ Training College. In 1959 he displayed his artworks for the first time on a one-man exhibition in City’s museum in Koprivnica. Josip left his native village Hlebine in 1960 and moved to Zagreb where he taught at an elementary school. In 1962 he graduated at the higher Teachers’ college. Josip Generalic got married in 1969 in Hlebine. His son Goran was born Sept. 1, 1971. Due to personal tragedies in his life, some of Generalic works make up the phase which he himself called the “Black Phase”. During his life, Josip Generalic has displayed his artworks on more than 1.000 collective exhibitions and 200 one-man exhibitions around the world. He was regularly present in all representative exhibitions of the Croatian and world’s naive art. The famous artist has been awarded by many international juries. Generalic did a few scene paintings for Zagreb theatres; he ilustrated childrens’ books and made about thirty tapestries; one of them entitled the “Big Grape Harvest” is permanently displayed in the Museum of Modern Art in Soitama, Japan. Josip’s oil on glass and canvas paintings, his serigraphies and copper-plate etchings can be found in many galeries and museums. For 15 years, he’s been working intensively on copper etchings, using his own press. Generalic has been acclaimed by the critics as the top artist in the field of paintings and graphics and one of the gratest representatives of the world famous “Hlebine school”. Josip Generalic’s works of art are classified into four phases: the Hlebine verism, flower phase, portraits of distinguished persons and black phase. In 1998 Josip moved back from Zagreb to Hlebine where he lived and worked. 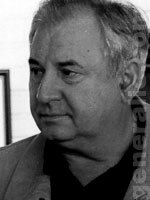 Josip Generalic died in Koprivnica on 22nd Dec 2004 and was buried in Hlebine.